Providing you the best range of handmade beaded tapestries and handmade tapestries with effective & timely delivery. 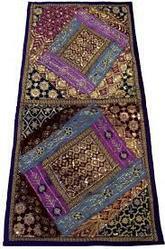 We presents a stunning Gujarati Handmade Beaded Tapestries in classic hand embroidered design style. Exquisite & intricate hand embroidery done by the craftsmen & embroiderers of Gujarat & Kutch using silk, linen & cotton threads. Beautiful & detailed gold wire embroidery too for the extra shimmer. 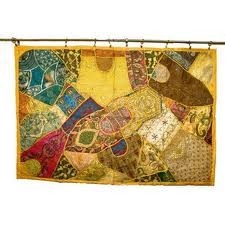 Our unique range includes religious, folk, tribal art design motifs on these gorgeous wall hangings. Delicate mirror work & glittering sequin work too on certain pieces.